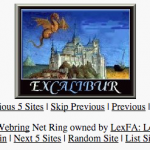 Remember webrings and banners? 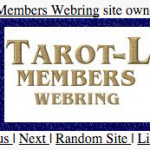 They used to be all the rage in the 90’s, in the earliest years of the web. And while a lot of older websites out there are still using them, as we’ve discovered in the process of overhauling our own site (there’s even a WordPress plugin for managing a webring), we’re electing to remove most of that code from our pages in the name of maintainability. But that said? We’re still pretty nostalgic about the webrings and banners. So here’s a gallery of screenshots dedicated to those! The previous version of our site had this graphic on the homepage. 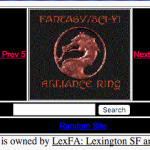 We’re keeping it here for posterity, ’cause here’s the thing: “viewable in any browser” on the modern web means something a lot different than it did back in the late 90’s or even in the early 2000’s when the LexFA site was originally built. What browsers existed back then are either actively defunct, or have been updated so many times that even web-savvy users would be hard pressed to connect them back to their descendants. But that said, modern web browsers have also been working hard on improving support for global CSS standards, and a lot of the other technologies available in modern web development. So that whole “Use Any Browser Here” thing? Still true today. Particularly when you also have to account for how modern web pages also need to look good on mobile devices. Which would be a big reason why we’ve pulled the site into WordPress! Likewise, here’s the Site Created With Notepad graphic. Which was all very well and good back in the day when putting up a web page meant you were in fact just wrestling with raw HTML. On the modern web, though, it ain’t that simple. Not if you want to really try to adhere to that aforementioned Use Any Browser Here thing, which increases the complexity of the code you have to wrestle. And if all you REALLY want to do is just update content, this is why the net gods gave us WordPress.